This page is about the city in Michigan. For other uses of “Charlevoix”, see Charlevoix (disambiguation). Aerial view of the town from above Lake Michigan; the small lake in the center is Round Lake and the larger one in the background is Lake Charlevoix. 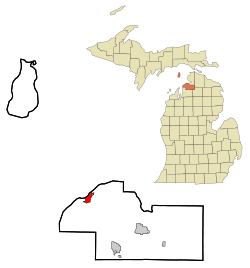 Charlevoix (/ˈʃɑːrləˌvɔɪ/ SHARL-ə-VOY) is a city in the U.S. state of Michigan. The population was 2,513 at the 2010 census. It is the county seat of Charlevoix County. Charlevoix Township is a separate municipal entity that completely surrounds the city and has a year-round population of 1,697. Typical of Northern Michigan towns, Charlevoix has a much higher seasonal tourist population in the summer. The city is situated between Lake Michigan and the western end of Lake Charlevoix, which drains into Lake Michigan through the short Round Lake/Pine River complex in the heart of downtown Charlevoix. The Charlevoix South Pier Light Station marks the opening of the channel onto Lake Michigan. Charlevoix's Round Lake has been called the best natural harbor on Lake Michigan. The only way to get from Lake Michigan to East Jordan, Boyne City and other sites on Lake Charlevoix by boat is via Charlevoix. As a result, much commercial, industrial, and recreational boat traffic passes through Charlevoix. The city of Charlevoix has a U.S. Coast Guard station located in its vicinity. Station Charlevoix has served the waters of Lake Charlevoix and Lake Michigan for over one hundred years. The station was first sited in 1898 on the south break wall of the Pine River Channel, leading into Lake Michigan. It was officially commissioned as a United States Lifesaving Service Station July 5, 1900. During the early 1960s, the station was relocated to its present-day location along the Pine River Channel's Lake Charlevoix end. The area of response for Station Charlevoix runs from Cross Village down to Leland, extending into Lake Michigan through Beaver Island and the North and South Fox Islands, and covers numerous inland lakes and waterways. Spring through late fall the 41' UTB and the 25' RB-S are in operation and during the winter months, the 14' ice skiff is put into operation. There is also a U.S. Coast Guard Auxiliary Flotilla based at the Station. Some USCG Auxiliary surface facilities are occasionally moored at Station Charlevoix. US 31 is a major highway running through the heart of the city. It continues southerly toward Traverse City and Muskegon and northerly toward Petoskey to a terminus near Mackinaw City. M-66 terminates at US 31 in Charlevoix and continues southerly through East Jordan and Kalkaska en route to the southern part of the state. [[Template:Infobox road/MI/link CDH|Template:Infobox road/MI/abbrev CDH]] begins at US 31 just northeast of the city and continues east-southeasterly toward Boyne City. [[Template:Infobox road/MI/link CDH|Template:Infobox road/MI/abbrev CDH]] ends at US 31 immediately west of the M-66 junction on the south side of the city. This route continues southerly toward Ellsworth and Central Lake. The Charlevoix County Transit System provides demand responsive transport, or dial-a-ride, bus service Monday-Saturday for the entire county. Fares are distance based. Indian Trails provides daily intercity bus service between Grand Rapids, Michigan and Petoskey, Michigan. Charlevoix Depot Museum is housed in the original train station; it is listed on the National Register of Historic Places. Regular intercity passenger train service ended on September 1, 1962 after the Chesapeake and Ohio Railway (C&O) discontinued Traverse City, Michigan – Charlevoix – Petoskey, Michigan service. Freight rail service ended between Charlevoix and Williamsburg, Michigan in 1982 after Chessie System abandoned the track. The state of Michigan purchased the track between Charlevoix and Petoskey from the Chessie System Railroads and contracted Michigan Northern Railway to operate it. This section of track was removed in the 1990s because of a series of washouts and no rail freight customers in Charlevoix. Sections of this rail line now serve as a bicycle trail. The Charlevoix railroad depot has been adapted as a museum of the Charlevoix Historical Society. Charlevoix Municipal Airport (IATA: CVX, ICAO: KCVX) is a public airport. In addition to private planes, the airport offers charter flights to Beaver Island and other locations (via Island Airways and Fresh Air Aviation). Commercial airlines serve Pellston Regional Airport (40 miles), Traverse City Cherry Capital Airport (48 miles), and Alpena County Regional Airport (108 miles). Charlevoix is named after Pierre François Xavier de Charlevoix, a French explorer who travelled the Great Lakes and was said to have stayed the night on Fisherman's Island during a harsh storm. During this time Native Americans were thought to have lived in the Pine River valley. The Odawa and Ojibwe lived throughout northern Michigan prior to European colonization. Charlevoix became the county seat in 1869 when Charlevoix County was formed, but by 1876, the Grand Rapids and Indiana Railroad had built a line north to Petoskey with stops in Boyne Falls and Melrose. This link to cities in lower Michigan brought increased population to Charlevoix County, and new political power to the eastern part of the county. European-American settlement of Charlevoix was initially by fishermen, who were there by 1852. Soon after its formation in the 1850s, the residents of Charlevoix entered into a short-lived conflict with Jesse Strang, leader and namesake of the Strangite Mormons, and then self-proclaimed 'king' of Beaver Island. Relations between Charlevoix residents and the Strangites were often tense. In 1853, a gunfight broke out between the two groups as the townspeople refused to hand over a man who was called for jury duty on the island, an event known locally as The Battle of Pine River. Strang was assassinated on June 20, 1856. Portion of the historic Chicago Club, one of the several large resort communities that developed in Charlevoix around the turn of the 20th century. 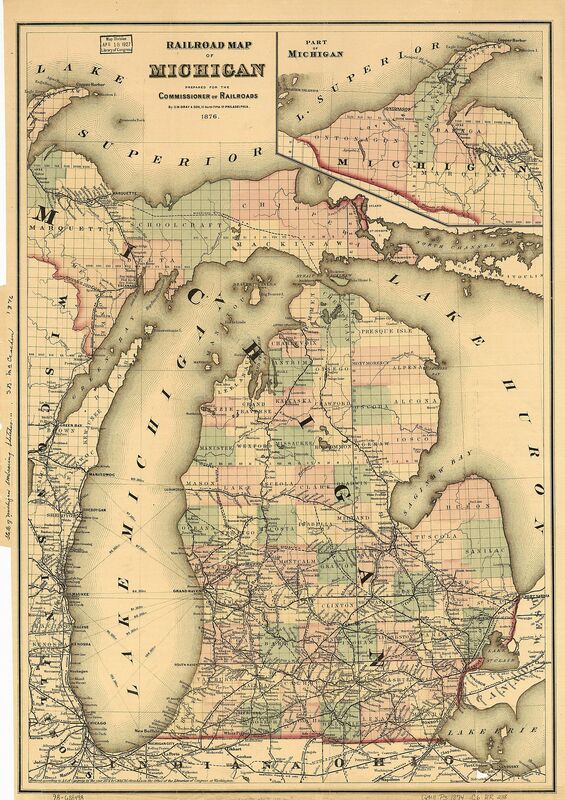 The Homestead Act of 1862 brought many Civil War veterans and speculators to Northern Michigan. It sold 160-acre tracts of land for $1.25 an acre. . In 1864, settlers built a large dock at the mouth of the Pine River on Lake Michigan. Boats there were exposed to the harsh vicissitudes of Great Lakes weather, so local entrepreneurs sought to connect Lake Michigan to an inland harbor at Round Lake. The Pine River channel was dredged in 1869, connecting Lake Michigan to Lake Charlevoix. In 1866, early settler John S. Dixon completed plats of the entire town (then called "Pine River"), showing that he owned most of the land. By 1867, Charlevoix had its first boarding house, the Fountain City House Charlevoix became the county seat in 1869 when Charlevoix County was formed. In 1869, the Charlevoix Sentinel was founded, which became a major newspaper of record for the area for the next 60 years. Prior to 1869, Lake Charlevoix (then known as Pine Lake) was two feet higher than Round Lake, which was 2 feet higher than Lake Michigan. In order to aid lumber and boat traffic, city leaders pooled resources to cut a channel between Lake Charlevoix to Round Lake, and to dredge the Pine River for navigation between Round Lake and Lake Michigan. When this was completed in 1869, lake levels dropped, and navigation between Lake Charlevoix and Lake Michigan was established. This had profound commercial implications for the area. Another transformative event came in November 1873 when rail operations arrived in "Bear Creek" (now known as Petoskey), 16 miles north. Passengers and goods passed through Petoskey and made their way to Charlevoix via boat or stagecoach. During the 1870s, Presbyterian evangelist Rev. George W. Wood, Jr. sold bibles to homesteading settlers throughout Charlevoix and Emmet Counties. Between 1868 and 1884, the Army Corps of Engineers used dredging and revetment to increase Pine River channel width from 75 feet to over 100 feet, and expanded the channel depth from under 6 feet to a depth of 12 feet. In 1876, Charlevoix was declared a port of entry and became one of the busiest ports on the Great Lakes. Lumber mills proliferated as the forests along Lake Charlevoix could finally be harvested. In 1876, John Nichols consolidated Charlevoix lumber operations into the Charlevoix Lumber Company, and it became a Charlevoix institution for decades. At its height in the late 1800s, the company annually shipped out more than 40 million board feet of lumber before it stripped much of the peninsula. For many years Charlevoix was a fueling stop for the wood-powered steamships on Lake Michigan. Charlevoix incorporated as a village in 1879. In June 1883, Charles J. Strang, the son of Mormon King James J. Strang started the Charlevoix Journal, which would be renamed the Charlevoix Courier in 1894. Dr. Levi Lewis and his wife Edith built the 800-seat "Lewis Grand Opera House" along the Pine River in 1883 in order to bring more culture to the backwater pioneer town. In 1880, several members of the First Congregational Church of Chicago formed a Chicago Summer Resort association, now known as the "Chicago Club." Early citizens contributed to the founding of such early institutions as the Lewis Grand Opera House (1883) and Methodist (1878) and Congregational (1885) churches. The Detroit-based D.M. Ferry Seed Company expanded their operations in Northern Michigan, developing the land along Lake Charlevoix in 1892. They built a 200' dock and warehouse complex there by 1905. Ferry's Charlevoix operations continued until 1927. In 1899, the Federal Revenue Cutter Service came to Charlevoix and began tending buoys on the north side of the Round lake train bridge. This site would later become known as the Coast Guard moorings. By 1901, industrialist James M. Felts of Rushville, Indiana had purchased thousands of acres between Mount McSauba and Big Rock point and began construction of a massive sugar beet factory to be called the Charlevoix Sugar Company. The National Construction Company of Detroit built the factory between 1902 and 1903 at the point where Stover Creek emptied into Pine Lake. The factory was not profitable, and by 1911 the factory had closed and the machinery was removed to Ohio. The building, made almost entirely of concrete, slowly decayed until it was demolished in 1964 to make room for the Irish boat shop. In 1909, Chicago real estate developer and Chicago Club of Charlevoix member Edward Carson Waller purchased 2000-acres north of the Pere Marquette rail line including the former Felts tract. He replanted the land with pine trees, and commissioned architect Frank Lloyd Wright to create a bathing pavilion on the site. The pavilion burned down in 1922 or 1923, but Waller continued to own the tract until his death in 1931. To this day, Waller Road extends through a large residential area on the north side of Charlevoix. The rail also brought tourist traffic during the summer. It was not long before the city became known as a resort destination. With three summer associations (the Belvedere Club, Sequanota Club, and the Chicago Club); a number of luxurious summer hotels, including The Inn and The Beach; and rail service at two train depots on the Pere Marquette Railway line (one depot for the Belvedere Club on the south side of Round Lake and one on the north side near the Chicago Club); Charlevoix became known as one of the nation's finest summer communities. In 1913, the Pine Point development (near Oyster Bay) opened on Pine Lake, making it one of the earliest neighborhood subdivisions in the Charlevoix area. Northern Michigan continued to be a resort destination after World War I. Beginning in 1918 real estate agent, regional promotor, and self-taught architect Earl Young began to design and build his signature "mushroom houses" and other buildings out of locally harvested boulders. In 1925, members of the Charlevoix Summer Resort Association decided their existing social club needed a golf course. The members called on Scotsman William Watson, who was working across town as head pro of the Chicago Club. Watson’s resume included working on such layouts like Interlachen Country Club in Minneapolis, Harding Park Golf Club, and the Olympic Club in San Francisco. At Belvedere he used five teams of horses and 150 men to build 18 holes through a pair of valleys dissected by Marion Center Rd. just south of town. Opened in 1927, the course soon became a respected tournament venue. In 1918, Albert Loeb, an executive from the Sears corporation in Chicago, built an experimental farm on the southern outskirts of Charlevoix. Known as Loeb Farms, the farm raised prizewinning cattle sold through the Sears Catalog. In its heyday it was the primary employer in Charlevoix County. Loeb's son became involved in an infamous murder trial (the Leopold and Loeb trial). During the trial, Scopes trial lawyer Clarence Darrow arrived at the Charlevoix train station to visit the Loeb family at Loeb Farms. Albert Loeb died in 1924 and the farm closed in 1927 after a three-year agricultural recession. In 1926. Pine Lake was renamed Lake Charlevoix. Between 1927 and 1948, Former Michigan Football player Lewis Reimann founded Camp Charlevoix as a recreational camp for at-risk boys. first in Ironton, Michigan and then in 1928 at a permanent 170 acre site on the shores of Lake Charlevoix. Reimann operated Camp Charlevoix for more than 20 years. After an expansion in 1937, Reimann sold Camp Charlevoix in 1948. Camp Charlevoix continued operations under Kenneth W. Smith until at least 1960. During Prohibition, Charlevoix became a popular place for gang members from the Chicago area. The Colonial Club, a restaurant and gambling joint on the city's north side became known as a popular place for the Midwest's most powerful and influential. John Koch, the club's owner, kept automobile license number "2", only second to the governor – a telling sign of his influence. The converted lumber barge Keuka served as a blind pig and speakeasy and sailed nightly between Boyne City and Charlevoix, hosting its guests in relative comfort. A murder aboard the ship and the pressure of US Treasury Department surveillance, however, forced the owner to scuttle the vessel in Lake Charlevoix. In the early 1930s photographer and historian Bob Miles began a 42-year career documenting the city of Charlevoix and surrounding areas. On March 9, 1935, The Petoskey Kiwanis Club sponsored a charter meeting of the Charlevloix Kiwanis Club. In 1939, the Charlevoix Kiwanis Club created Boy Scout Troop 11. Troop 1l is the second oldest Boy Scout troop in Northern Michigan. Several bridges had been built to cross the Pine River. 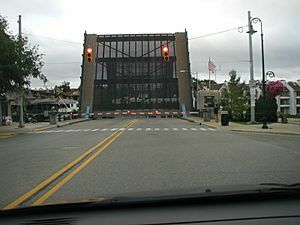 A drawbridge was planned to be built in 1940, but due to Pearl Harbor, the completion of the current Charlevoix drawbridge bridge was delayed until 1947. The City of Charlevoix suffered economically during the decades after World War II, due to industrial restructuring and changes in fashion, as people used automobiles and airplanes to travel to new tourist destinations. The manufacturing base was displaced with jobs moved elsewhere, the train lines to the city ceased operating, and the larger tourist hotels closed due to competition from other locations. Many empty buildings were left downtown. Several large corporations, such as the nuclear power plant and the cement plant, set up operations in the early 1960s and spurred economic development in the area. In the 1960s, the lifesaving station was relocated from along the channel to the east part of Round Lake. November 18, 1958, Charlevoix City Hall served as a makeshift morgue for the bodies of crewmen of the SS Carl D. Bradley after the lake freighter foundered in Lake Michigan during a severe storm. The USCGC Sundew, stationed at Charlevoix, was one of the first vessels to arrive at the search area and played a pivotal role in that night's rescue of the two surviving crewmen. Charlevoix was home to Michigan's first nuclear power plant, Big Rock Point, which operated from 1962 to 1997. On January 7, 1971 an unarmed USAF B-52C-45-BO, 54-2666, of the 9th BW, Westover AFB, Massachusetts, crashed into Lake Michigan near Charlevoix during a practice bomb run, exploding on impact. Only a small amount of wreckage, two life vests, and some spilled fuel were found in Little Traverse Bay. The bomber went down six nautical miles from the Bay Shore Air Force Radar Site and close to the Big Rock Point Nuclear Plant. Nine crew KWF. In the 1960s, the Medusa corporation decided to build their first greenfield cement plant. they build a cement plant in Charlevoix that came on line in 1967. The plant is located south of town off of US 31 near Fisherman's Island State Park. In the late 1970s, Crane Company took over Medusa and began consolidating operations. This not only resulted in modernization and investment in the Charlevoix plant, but personnel (and their families) from other Crane cement holdings were transferred into the Charlevoix area in the late 1970s and early 1980s. . In the late 1990s the cement plant was bought out by Cemex, a transnational company from Mexico. In 2000 Cemex sold the plant to St Marys Cement Group. Until 2013 the cement plant was a frequent port of call for the oldest freighter on the great lakes, SS St. Marys Challenger. In 1965 the Loeb Farms complex that had been fallow since 1927, was turned into a medieval castle tourist attraction by John Van Haver . This venture quickly folded and was bought by the Reibel family in 1969. For the next ~25 years, the Castle Farms complex hosted large rock concerts. In 1974, Terry and Judy Edger opened WVOY-AM in Charlevoix. WVOY was a 5,000-watt daytime-only station at 1270 kHz on the AM dial. WVOY was one of the first all-contemporary-hit-music radio stations in northern Michigan and featured Bill Vogel ("The Captain," formerly of Detroit's WDRQ), John Yaroch, Rick Durkin, and other major-market-quality talent. Despite WVOY's limited signal, the station became extremely popular and gave northern Michigan listeners a taste of the "big city" radio sound. In May 1980, former WVOY employee Tim Moore started the WKHQ-FM "The Rhythm of the Northwest" radio station in downtown Charlevoix using TM Programming's "Stereo Rock" format. Despite moving its studios to Petoskey in the 1990s, WKHQ is still licensed as being from Charlevoix. The station was mentioned by Casey Casem several times on American Top 40 radio program in the 1980s. The 1980s brought many condominium developments in the area. In 1991, former farmland near Stover Creek along M-66 was developed into "Charlevoix Commons" shopping center, anchored by a K-mart with the Charlevoix Estates mobile home park across the street. Several new businesses established themselves in this area, and the Post office moved from downtown to this site in 1996. In 1993 600 acres of the undeveloped Waller tract on the north side of town was transformed into an 18-hole golf course and residential development named the Charlevoix Country Club. After the 1996 murder of JonBenét Ramsey, whose family spent summers in Charlevoix and had won a pageant in the town, Charlevoix became a regular haven for tabloid photographers, hoping to catch a glimpse of the Ramsey family. John Ramsey, JonBenet's father and husband of the late Patsy Ramsey, still resides in Charlevoix. In 1997, Charlevoix made national news when it experienced a fireworks disaster during the Venetian Festival. At least one person died and 17 othes were injured, while windows were shattered across downtown. In 2004 and 2005, Wal-Mart tried to build a 157,00 square foot superstore on the edge of town (Charlevoix Township) near the intersection of US-31 and Marion Center Road across from the Charlevoix airport. Amid community disagreement, some local businesses and residents formed a group called "This Is Our Town" and successfully resisted the entry of Wal-Mart into their community. For a list of historical landmarks, see Charlevoix County. Petunia Planting- Petunia planting began in 1982 when "Keep Charlevoix Beautiful" organization member Dale Boss had a vision to line the streets of the city with thousands of petunias from the north side of the city limit all the way to the south and "Operation Petunia" began. Now, every Thursday before Memorial Day hundreds of residents gather to plant over 60,000 petunias up and down Main Street. Venetian-The Venetian Festival began in 1931 with a very simple boat show in Charlevoix's Round Lake and has now grown into a week-long festival bringing in tens of thousands of people and costing $200,000. Venetian now includes two nights of some of the best fireworks in Northern Michigan, big name concerts, a parade, athletic events, a carnival, a boat parade, and many more family friendly and adult activities. Apple Fest- The 30th annual Apple Festival was celebrated in October 2008. The Apple Festival celebrates one of Northern Michigan's most prominent fruits, the apple. It gives local farmers the chance to sell their harvest right in the downtown Charlevoix area. The festival also includes pony rides, face painting, a craft show and many more activities to draw in tourism. Car Raffle- Charlevoix has an annual car raffle, sponsored by Charlevoix Chamber of Commerce, to generate funds for capital improvements and operations. Art and Craft Show- The art and craft show is held one weekend in July each summer in downtown Charlevoix. 150 artists and craftsmen come from all over the United States to sell their work. Charlevoix bills itself as "Charlevoix the Beautiful" on its promotional literature and on municipal signs around the city. This moniker was also the name of a book by prominent local "stone house" architect Earl Young. Charlevoix is primarily served by four newspapers: the Charlevoix Courier, the Petoskey News Review, the Traverse City Record-Eagle, and the Detroit Free Press. Most television and radio stations are based in Traverse City and serve all of the Northern Michigan region including Charlevoix. Charlevoix has one movie tri-plex theater embedded within its downtown and no big box shopping outlets except for Kmart, having outlawed them after refusing Wal-Mart's proposed store on the edge of the city. There is a community pool on the north side of town and a bowling alley on the south side near the Charlevoix Municipal Airport. Typical of small towns, high school athletic events are an integral part of Charlevoix's culture. During the winter, the town's basketball team draws much of the locals' attention. Recently, a skate park was built on the south side of town with the help of donations. The Charlevoix Community Skatepark opened in 2006. The park is supervised by Cameron Canupp and Laura Stebe and helmets are required. Skateboards, Inline Skates and BMX bikes are allowed. Several notable golf courses are built around Charlevoix: Belvedere Golf Club, Charlevoix Country Club, Dunmaglas, Antrim Dells, and the nine-hole Charlevoix Municipal Golf Course, which was once eighteen holes as part of the Chicago Club. Skiing in the area is common winter sport in Northern Michigan, with the closest resort being Boyne Mountain near Boyne City. Charlevoix used to be a "one stoplight town" until it received a second stoplight in the 1980s at the intersection of M-66 and US 31. Los Angeles-based singer/songwriter Joe Henry, who spent much of his childhood in Michigan, includes a song entitled 'Charlevoix' on his 1990 album Shuffletown. According to the United States Census Bureau, the city has a total area of 2.17 square miles (5.62 km2), of which 2.05 square miles (5.31 km2) is land and 0.12 square miles (0.31 km2) is water. Charlevoix is part of Northern Michigan. This climatic region has large seasonal temperature differences, with warm to hot (and often humid) summers and cold (sometimes severely cold) winters. According to the Köppen Climate Classification system, Charlevoix has a humid continental climate, abbreviated "Dfb" on climate maps. As of the census of 2010, there were 2,513 people, 1,266 households, and 651 families residing in the city. The population density was 1,225.9 inhabitants per square mile (473.3/km2). There were 2,201 housing units at an average density of 1,073.7 per square mile (414.6/km2). The racial makeup of the city was 94.2% White, 1.2% African American, 2.0% Native American, 0.5% Asian, 0.2% from other races, and 1.8% from two or more races. Hispanic or Latino of any race were 0.9% of the population. There were 1,266 households of which 20.3% had children under the age of 18 living with them, 36.9% were married couples living together, 10.7% had a female householder with no husband present, 3.8% had a male householder with no wife present, and 48.6% were non-families. 42.5% of all households were made up of individuals and 18.9% had someone living alone who was 65 years of age or older. The average household size was 1.94 and the average family size was 2.61. The median age in the city was 48.1 years. 17.5% of residents were under the age of 18; 7.9% were between the ages of 18 and 24; 19.8% were from 25 to 44; 31.3% were from 45 to 64; and 23.6% were 65 years of age or older. The gender makeup of the city was 47.2% male and 52.8% female. As of the census of 2000, there were 2,994 people, 1,375 households, and 812 families residing in the city. The population density was 1,465.8 per square mile (566.7/km2). There were 2,096 housing units at an average density of 1,026.2 per square mile (396.7/km2). The racial makeup of the city was 94.92% White, 0.27% African American, 2.84% Native American, 0.20% Asian, 0.43% from other races, and 1.34% from two or more races. Hispanic or Latino of any race were 1.24% of the population. There were 1,375 households out of which 25.7% had children under the age of 18 living with them, 46.7% were married couples living together, 9.6% had a female householder with no husband present, and 40.9% were non-families. 35.4% of all households were made up of individuals and 15.2% had someone living alone who was 65 years of age or older. The average household size was 2.14 and the average family size was 2.76. In the city, the population was spread out with 21.6% under the age of 18, 8.4% from 18 to 24, 26.4% from 25 to 44, 24.2% from 45 to 64, and 19.4% who were 65 years of age or older. The median age was 41 years. For every 100 females there were 88.7 males. For every 100 females age 18 and over, there were 84.0 males. The median income for a household in the city was $35,284, and the median income for a family was $42,853. Males had a median income of $31,544 versus $24,375 for females. The per capita income for the city was $21,319. About 3.7% of families and 9.5% of the population were below the poverty line, including 6.8% of those under age 18 and 9.1% of those age 65 or over. Charlevoix has recently begun to contend with the prospect of urban sprawl. Following the construction of a K-mart plaza development in the 1990s, many businesses and the post office moved to this area. There was significant controversy in the 1990s over the decision to extend water pipes into rural farmland south of Charlevoix in order to build a new Charlevoix High School. In the early 2000s, Charlevoix, led by Green Party Drain Commissioner JoAnne Beemon, successfully fought off a bid by Walmart to open a store along this new water pipeline on the south edge of town. From 2006 to 2008, Charlevoix has offered to host the LaSalle-Griffon Project, a project that seeks to the ruins of a shipwreck that may be Le Griffon. In late 2012, Charlevoix has a local controversy about an Onaway Stone fireplace that was donated and being constructed in east park with an annual operating cost of $6,700.00. Charlevoix, Michigan Facts for Kids. Kiddle Encyclopedia.